ES Microwave, LLC. is a leading manufacturing of Suspended Substrate Filters, Multiplexers and Switched Filter Banks, covering the frequencies range of 1 MHZ to 40 GHZ. Unique design techniques, broad range capabilities, in-house computer aided design programs and in-house CNC machining center enable us to produce quality products, on-time delivery, competitive pricing and satisfied customers. Our quality assurance program complies with MIL-STD-45208A and MIL-E-5400 class II. 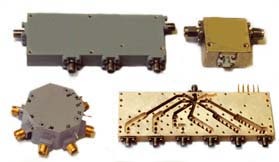 Along with Filters and Diplexers, we offer our standard Image Reject Mixers and Quadrature IF Mixers in the frequency range of 1 to 18 GHZ. These are our connectorized stripline low profile standard Mixers. We urge you to contact us with your special requirements.